Adam Billings, former Dutch Boy drum major, sent this picture. 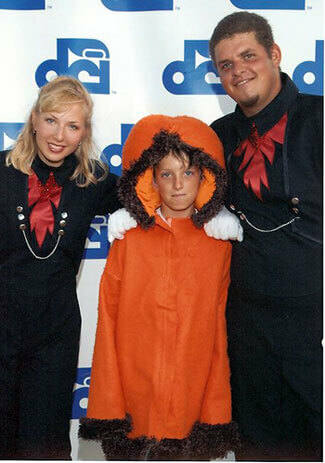 This is a picture that was taken at the DCI Divisions II & III preliminary competition at the 2006 World Championships in Madison, Wis.
Pictured is Christine Newman, 2006 and present drum major for the Dutch Boy. She is very excited to be returning as drum major of one of Canada's best drum and bugle corps. Entering her second year as drum major, Christine joins Dutch Boy from Arkansas. Next is Owen Kappler-Thompson, a member of the Cadets of Dutch Boy (prep band to the junior drum corps) who came on the road as "Kenny." Since we were performing the music of the "South Park," cartoon last season, the design team decided to add Kenny to our show. Pictured last is me. I celebrated my 22nd birthday and aged out of the drum corps activity. I am currently the administrative assistant for the drum corps and I still travel to places where the drum corps goes. I would like to thank Dutch Boy Corps Director Steve Meikle for allowing me to be the drum major of the corps and all the staff: Nick, Keith, Dave, Jason, Bruce, Roo, Rob, Jamie, Andrea, Leigh, Lianne and Angela for all your support during the year. I look forward to working with you guys this summer and in the future. I would also like to thank Josh Coit—another ageout—for being out on the field helping me out a lot. And finally to all of the support staff and my friends in the drum corps: You guys rock, and I will never forget you. Once Dutch, always Dutch!